Wide spectrum of reports including detailed views or snapshot, tax reports, account statements etc. Variety of viewing options classified by assets, fund houses, categories, folios etc. We understand that you would like to manage your money and portfolio. Hence, we have empowered you with essential research and analysis tools. Choose between a wide spectrum of report viewing options ranging from a snapshot to meticulous account statements or gain/loss reports. 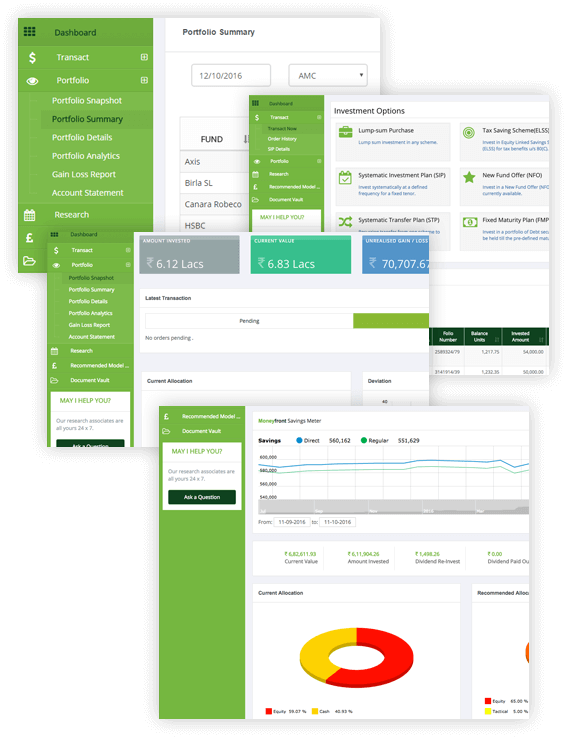 Viewing option can be further streamlined based on parameters like assets, fund houses, mutual fund categories, composition of sectors, companies and rating profiles. Easy, simple and convenient, the portfolio reports provide you with a comprehensive synopsis of the best performing mutual funds in your portfolio. customized to your liking, Moneyfront helps you create the best portfolio; SIP or lumpsum mutual fund investments, your money can buy.